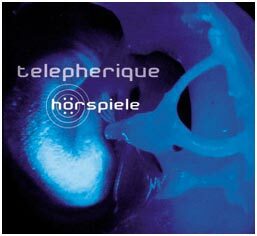 Shame on me, I'm really not that familiar with Telepherique's extensive discography, so I don't know if he's released more works in this style or if this is a one-of-a-kind experiment. But anyway, this is great stuff. In his own words: "The background of the music contained in this CD is the sensibility of hearing. The chance of dreaming, meditating and travelling by the means of well known noises that we can hardly hear because they always surround us". As you can expect, the very pulp of this CD is field recordings and concrete sound manipulation - a very structured one, actually. Telepherique's looped mantras of familiar and less familiar sounds (from bells to found voices, from birds and frogs to mechanical rumblings) have reminded me a lot of Murmer's strategies of repetition; but Telepherique is generally less minimal and adds several layers and changes to his compositions, plus some fragments of played/programmed music as well (with some actual beats in "Fernweh", which I found a bit out of place here). The result is incredibly fascinating, vivid and moving; there's no trace of sterile academic masturbation here, but a rich, detailed sonic mass which crushes you to earth with tyrannical gravity just to lift you up to extasy the next moment, with soothing, fragile sounds. A work showing a remarkable tecnique and a taste for balanced, mathematical compositions, but most of all, big ears and a big heart to re-discuss and reactivate everyday sounds into new forms. Brilliant layout too, courtesy of Hue/Sparkle in Grey, with stylish electric blue photos perfectly accompanying the CD concept.